It’s as easy as 1-2-1-2-3-4! Need an easy cookie recipe that is healthy AND yummy? That will impress your loved one this Valentine’s day? That can be made in less than 20 minutes?! Ding, ding, ding! Bex has got your back. I experimented with this recipe last week and it was a hit with my roommates here in DC! Follow along on my student blog at The Washington Center by clicking the link to see what I do on a weekly basis! In a medium bowl, mash 2 very ripe bananas. 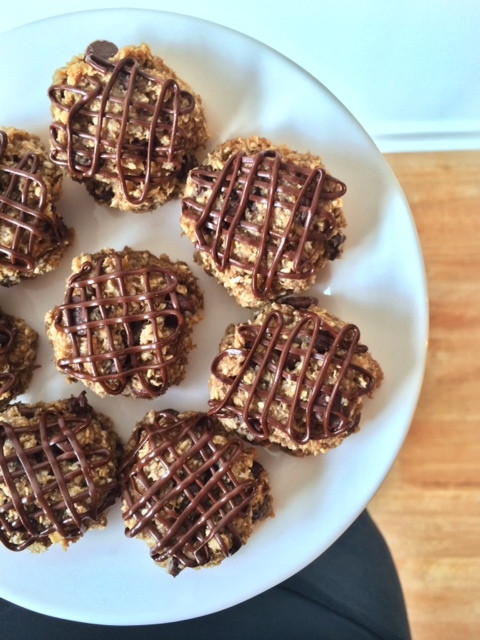 Mix in rolled oats, chocolate morsels and peanut butter until you reach a cookie dough consistency. Spoon dough by the tbsp. onto a greased cookie sheet. Recipe makes approximately a 16 cookies. Bake for 10-12 minutes. Let cookies cool for a few minutes. Meanwhile, melt a handful of chocolate morsels with a touch of shortening for 25 seconds in the microwave. Spoon into a Ziploc bag. Cut a tiny hole in the corner of the bag and squeeze hot chocolate ontop of the cookies in an artsy manner. Easy peasy, my friends! Bon appetit! Hey Bex! I jus tried this recipe, but the cookies turned out being too chewy and undercooked. I tried putting them in the oven longer but it didn’t work. Any ideas why?